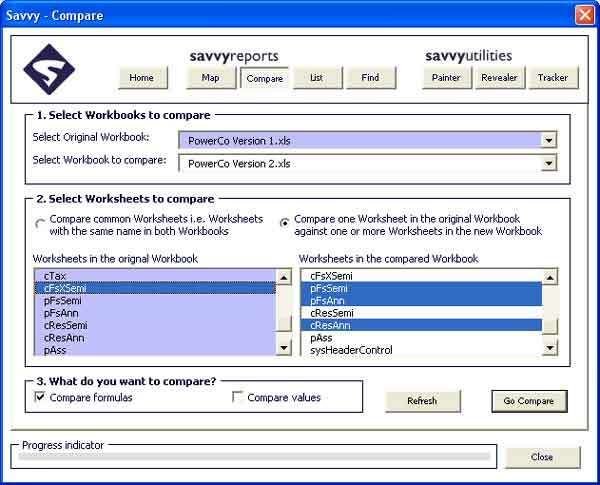 Savvy Compare : This tool performs a comparison between the contents of different worksheets and produces a report of any differences in formulas or in output values. The tool contains time saving features allowing you to perform multiple comparisons in one run. You can use this tool to find out what has changed between two different versions of the same model (i.e. two workbooks), or to see what has changed between two different worksheets. Example Scenario : "I originally sent the new analyst our latest portfolio hedge fund excel model for updating. Since this time the model results are now showing errors and the analyst is now on holiday in Chile. No one can get hold of him. The model is so complex and I don't know exactly what he changed." Savvy solution : "Open both the original hedge fund model and the newly updated model in a session of Excel. Run the Savvy Compare tool and look for changes in logic between the workbooks. 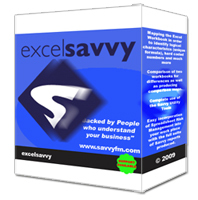 The Savvy Reports produced will guide your search to the specific areas that are different between the models." Example Scenario : "I have a financial forecasting model which our company uses for setting future budgets. I have an input assumption worksheet that I have to update periodically. My boss wants me to use an old version of the assumptions. She also wants me to tell her the difference between these old assumptions and our new ones we agreed on". 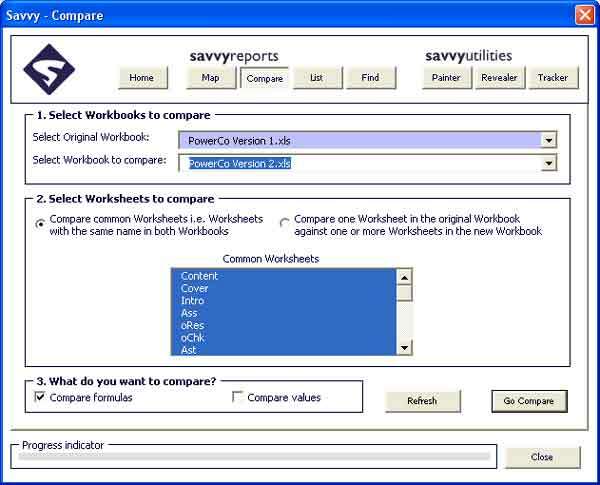 Savvy solution : "By opening the workbooks with the old and new assumptions worksheets in a session of Excel, the Savvy Compare tool can be used to compare values (i.e. numerical assumptions). As long as the worksheet structure matches both old and new, the Savvy Report will answer your boss's questions." Example Scenario : "I have a 'monster' model 70MB in size but I have assured my department that it is easy to maintain as 35 of the 40 total worksheet are logically all the same. Although I am a trusted individual within our organisation, I would like to provide everyone some assurance that this is the case". Savvy solution : "Open the 'monster' model in a session of Excel. Select the Savvy Compare tool and select the option to compare one worksheet against one or more worksheets. The Savvy Report will show any logical differences between the worksheets. This Savvy tool is often used by companies who want to see the difference in worksheet templates within large Excel models."